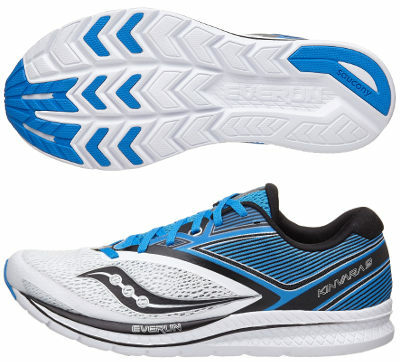 Saucony Kinvara 9 are neutral cushioned running shoes. It is getting harder and harder for mythical Saucony Kinvara 9 nowadays. Its success was based on simplicity: clean upper, huge cushioning, lightweight and great performance at limited price. It was disruptive once but many other brands have released several running shoes following successful idea (most popular one would be New Balance Fresh Foam Zante v4) and even Saucony has developed one of the most interesting competitor with Freedom ISO which also includes latest flagship foam (EVERUN) from american brand. Anyway the Kinvara 9 keeps its distinctive 4 mm drop and features innovative EVA+ foam in midsole to reduce (even more) weight and improve overall performance. There is not much room for changes from its predecessor Kinvara 8 if it wants to stay true to its soul. Upper restyling is mandatory in annual updates (at least to justify price rise) so more robust fabric is used around the heel to keep everything in place and improve stability (in a similar way Brooks Ravenna 9 does) while lighter and plenty of ventilation holes rules in forefoot for enhanced breathability. It is strange that Pro-Lock™ solution which embraces midfoot is again available in current Kinvara 9 after not so positive feedback but maybe mesh and melded overlays are not enough for snug and secure fit. Midsole in Kinvara 9 maintains same configuration with full-length EVERUN topsole for improved response above thick piece of EVA+ foam, latest development (aside from mentioned EVERUN) from Saucony which features a better performance at lower weight. Outsole follows same trend than in bigger sibling with pronation control Guide 10 reducing from 4 to 3 the number of blocks in the forefoot while keeping TRI-FLEX lug pattern for great traction that enables quicker toe-off. More exposed areas include solid rubber to increase durability and improve grip on wet conditions.